AUD 2,134 Excl. Duties / Taxes. This Heart diamond is 0.51 carat in weight, and comes with Excellent polish and Very Good symmetry, as verified from an independent gemological laboratory. The diamond is graded F in colour, and has a clarity grade of VS1. The diamond's GIA grading report number is 5202166110, which will detail further its specifications and measurements, and will also come with the purchase of the stone. This Heart diamond is 0.33 carat in weight, and comes with Very Good polish and Very Good symmetry, as verified from an independent gemological laboratory. The diamond is graded F in colour, and has a clarity grade of VS1. The diamond's GIA grading report number is 2236193917, which will detail further its specifications and measurements, and will also come with the purchase of the stone. AUD 3,544 Excl. Duties / Taxes. This Heart diamond is 0.91 carat in weight, and comes with Very Good polish and Very Good symmetry, as verified from an independent gemological laboratory. The diamond is graded K in colour, and has a clarity grade of VS1. The diamond's GIA grading report number is 2175091297, which will detail further its specifications and measurements, and will also come with the purchase of the stone. AUD 2,324 Excl. Duties / Taxes. This Heart diamond is 0.76 carat in weight, and comes with Good polish and Good symmetry, as verified from an independent gemological laboratory. The diamond is graded J in colour, and has a clarity grade of VS1. The diamond's GIA grading report number is 2131839916, which will detail further its specifications and measurements, and will also come with the purchase of the stone. This Heart diamond is 0.52 carat in weight, and comes with Excellent polish and Very Good symmetry, as verified from an independent gemological laboratory. The diamond is graded F in colour, and has a clarity grade of VS1. The diamond's GIA grading report number is 2201112191, which will detail further its specifications and measurements, and will also come with the purchase of the stone. AUD 7,511 Excl. Duties / Taxes. This Heart diamond is 1.01 carat in weight, and comes with Excellent polish and Excellent symmetry, as verified from an independent gemological laboratory. The diamond is graded F in colour, and has a clarity grade of VS1. The diamond's GIA grading report number is 2307821811, which will detail further its specifications and measurements, and will also come with the purchase of the stone. AUD 7,035 Excl. Duties / Taxes. 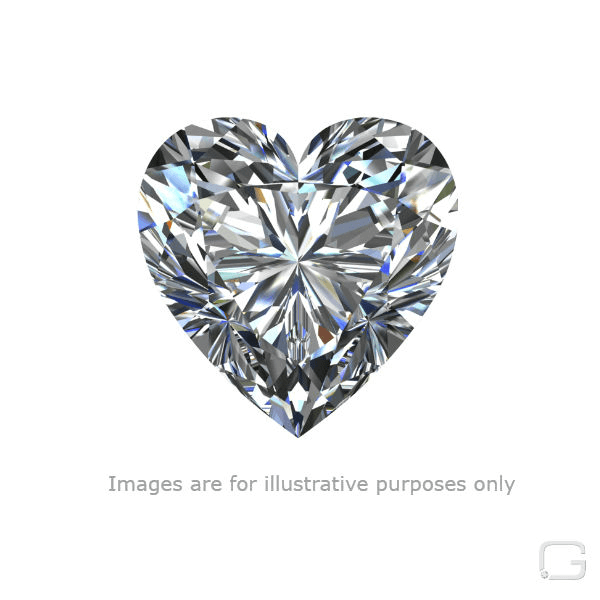 This Heart diamond is 1.01 carat in weight, and comes with Excellent polish and Excellent symmetry, as verified from an independent gemological laboratory. The diamond is graded D in colour, and has a clarity grade of VS1. The diamond's GIA grading report number is 5286467667, which will detail further its specifications and measurements, and will also come with the purchase of the stone. AUD 18,816 Excl. Duties / Taxes. This Heart diamond is 2.1 carat in weight, and comes with Excellent polish and Very Good symmetry, as verified from an independent gemological laboratory. The diamond is graded I in colour, and has a clarity grade of VS1. The diamond's GIA grading report number is 1315719598, which will detail further its specifications and measurements, and will also come with the purchase of the stone. AUD 8,111 Excl. Duties / Taxes. This Heart diamond is 1.05 carat in weight, and comes with Excellent polish and Excellent symmetry, as verified from an independent gemological laboratory. The diamond is graded G in colour, and has a clarity grade of VS1. The diamond's GIA grading report number is 1313842005, which will detail further its specifications and measurements, and will also come with the purchase of the stone.